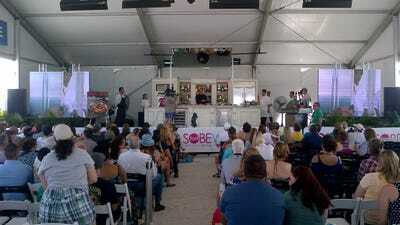 By all accounts, the Food Network South Beach Wine & Food Festival is a runaway success. 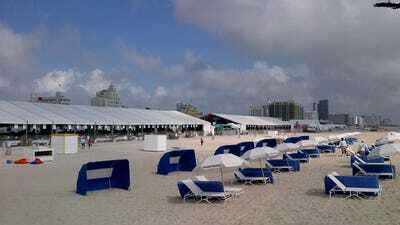 Now twelve years running, originally starting as a humble one day celebration on the Florida International University Campus, the SBWFF has morphed into a four-day annual beachfront financial juggernaut, attracting big dollar sponsors, 60,000+ festival attendees and TV chefs clamoring to fortify their brands and touch their rabid fans. Every household name celebrity chef was in attendance Bobby Flay, Giada De Laurentiis, Masaharu Morimoto, Rachael Ray, Anthony Bourdain, Emeril Lagasse, Geoffrey Zakarian, and countless more conducted cooking demonstrations, hosted late night parties, hocked books and partied like rock stars. Even Guy Fieri, seeming nonplussed by the recent parody menu skewering his NY flagship restaurant, made the rounds. While the festival itself is non-profit, with all proceeds benefitting Florida International University, attending the festival can be quite pricey. Want to attend the event “Tribute Dinner honouring Nobu Matsuhisa and Christophe Navarre with Mistress of Ceremonies Martha Stewart Presented by Bank of America part of the New York Times Dinner Series”? That event alone is $500pp and there are up to 20 events per day, scattered across hotels, restaurants and tents around Miami Beach. 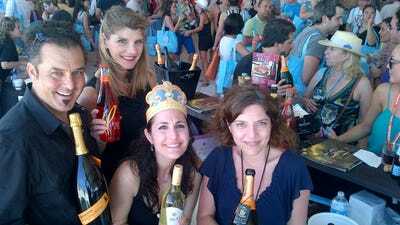 Join us on a peek inside the PR and financial machinations of America’s sexiest food fest. 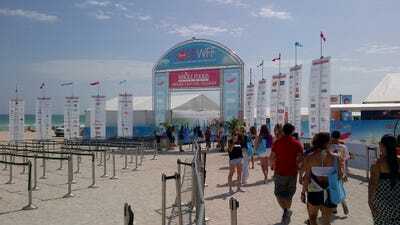 Editor’s Note: SBWFF regional PR firm Brustman & Carrino comped DeSouza’s entrance fee to the festival. First things first … time to pick up the Media Passes to the festival, so off to Suite #437 at The Loews Hotel, the spectacular beachfront convention resort where the South Beach Food & Wine Festival's PR team was based, and where many of the star chefs stayed during the festival. 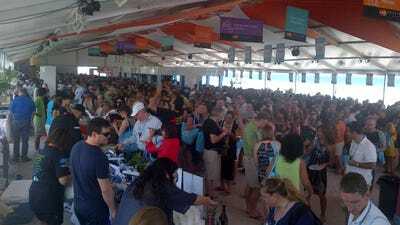 The festival entrance to the Whole Foods-sponsored Grand Tasting Village lays squarely on the doorstep of America's Riviera, 13th Street & Ocean Drive in South Beach. 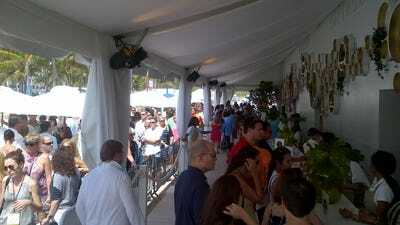 Fans start lining up at 10:30 am in the hot Miami morning sun. Getting into the Grand Tasting Village takes about 20 minutes, with thousands of people snaking around stanchions until they reach Check In, where they receive a Tasting Glass (more on that later), and a Buick-emblazoned Gift Bag containing a wackadoodle array of Diet Pepsi, Badia steak seasoning and olive oil, Ziggy Marley roasted hemp seeds, a Kingsford can coozie, Cape Cod potato chips and Goya guava nectar. 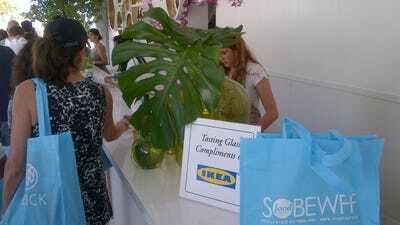 The Tasting Glasses were sponsored by Ikea. If you look down the counter, you'll see each glass comes with a lanyard to wear the glass around your neck. Every glass of wine, champagne, beer, vodka, rum … whatever you consume during the festival, well, that's your glass. The entire Welcome centre was sponsored by Kim Crawford Wines, presumably for big bucks. 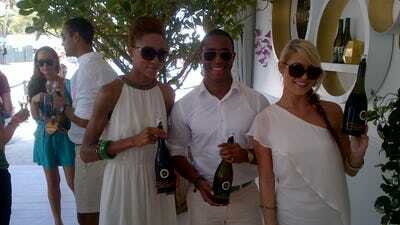 And Kim Crawford promo models were on-hand to pour a glass of perfectly chilled wine to everyone entering the festival. At a $225 per person entrance fee, a glass of wine upon arrival was a welcome sight. One of the models told me she was styled by J. Crew. Because we arrived early, we breezed through the entrance. But by 2 pm, lines even snake around those stanchions, baking people in the midday sun. Attendees are inundated by sponsor logos on every surface, a brand marketer's dream. Once inside, the celebrity quotient hits you squarely in the face – domestic diva Martha Stewart, Iron Chef Masaharu Morimoto, Food Network personality Anne Burrell, legendary restaurateur Emeril Lagasse, chef-turned-talk show host Rachael Ray, celeb chef Tyler Florence, and CNN's Anthony Bourdain coupled with British phenom Nigella Lawson will be speaking and greeting fans, up close and personal, within hours. Iron Chef Morimoto conducts a live cooking demonstration. 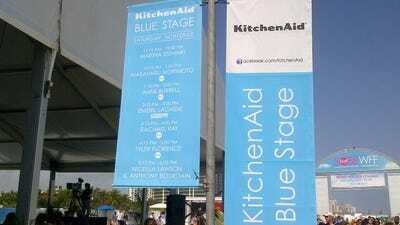 Every demonstration is filmed and recorded, tweeted, branded and leveraged by Food Network, print partner Food & Wine Magazine and of course, touted by Kitchen Aid, the exclusive appliance partner for the entire festival. 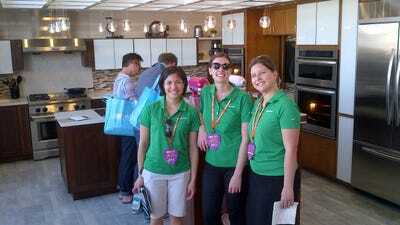 Next door, the Kitchen Aid tent had electricity, air conditioning, showroom flooring and incredible lighting. While they revealed to me the installation took four solid days to set up, they politely declined to reveal their total budget. Assume it is six figures. By the way, this photo only represents 50% of the installation. Tanqueray Gin installed an intimate, stylish bar, complete with tables, chairs, bright red umbrellas and of course, hot promo models on-hand to serve drinks and answer questions about the brand. 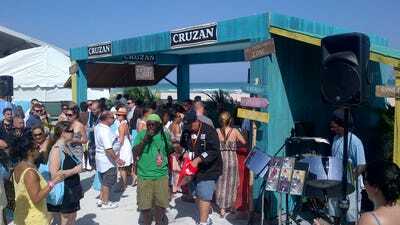 Cruzan Rum, a Jim Beam brand produced in the Virgin Islands, had an impressive and assumedly expensive installation, a shanty-themed Caribbean island bar complete with live entertainment – a steel drum player and reggae singer blasted guests with good vibes as visitors drank exotic rum concoctions. 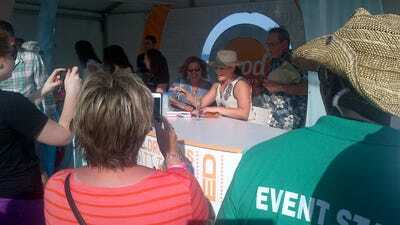 Perky celebu-chef and Emmy Award-winning TV host Rachael Ray was up next in the book signing booth, featuring tight security. 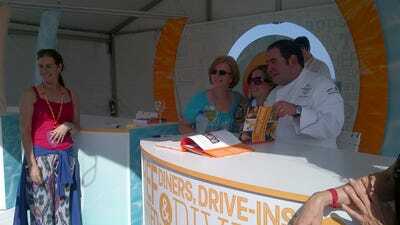 Surrounded by publicists and handlers, the crowd to get photographed with her was roughly twice that of Emeril's. Now let's enter the mob scenes in the Grand Tasting tents, two gigantic adjacent tents full of local restaurants, and wine and spirits suppliers that provided unlimited samples to everyone in attendance. Beverage companies and packaged goods companies pay hefty fees to participate in the festival, but local restaurants do not pay booth fees – they just have to commit to serving 1,500 food items per day, plus labour to serve the crowds. Whispering Angel, a French rose wine producer, had a stunning eastern European model pouring product. Mionetto, an Italian prosecco brand, pulled out all the stops, purchasing three consecutive booths, manning them with four employees, and having their National Sales Director onhand. They told me they spent $15,000 to participate in the festival, and that's before product, labour, POS material, hotel rooms, transportation and incidental costs. 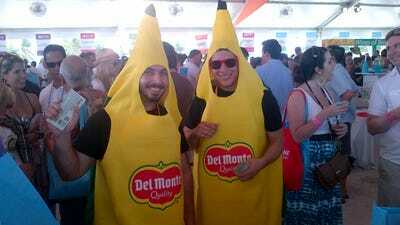 Look, it's the Del Monte banana guys! Social media marketing was everywhere – Whole Foods, Mastercard, Kim Crawford, and Evian all had major SBWFF plays. 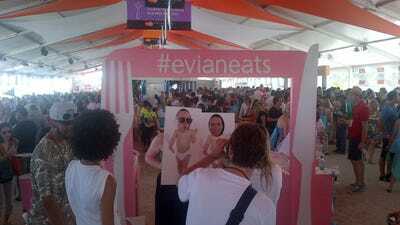 In this case, Evian had baby body props, took ridiculous photos of people, printed out the photos within seconds as souvenirs, and encouraged fans to hashtag #evianeats to trend the show. 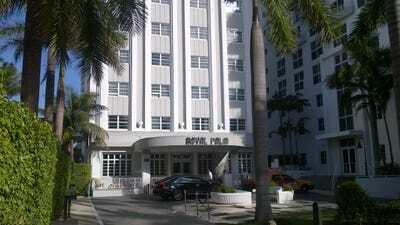 Miami has a major Brazilian population, not only as residents, but as real estate investors, snapping up Miami property at breakneck speed in all-cash deals. 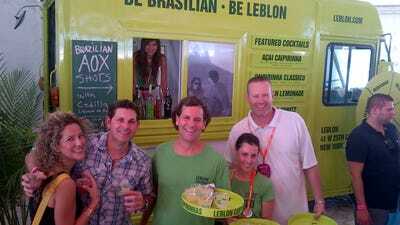 Pictured here is a fun drink truck installation by Leblon, a producer of cachaça, the main ingredient in the national drink of Brazil. Even lodging brands were getting into the festival game. 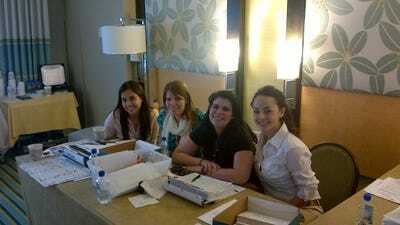 Marriott was giving away relaxing seaside massages in a chill out lounge. After a long hot day of cocktails galore, there was a waiting list for the masseuses. Several Iron Chefs participated in a panel. The takeaway? Winning Iron Chef America = success, both on TV and off. Endorsement deals, book deals, restaurant consulting gigs, radio shows, investors lining up to finance new restaurants, and Dancing With The Stars aspirations. Left to right: Chefs Bobby Flay, Marc Forgione, Geoffrey Zakarian, Michael Symon and Alex Guarnaschelli. 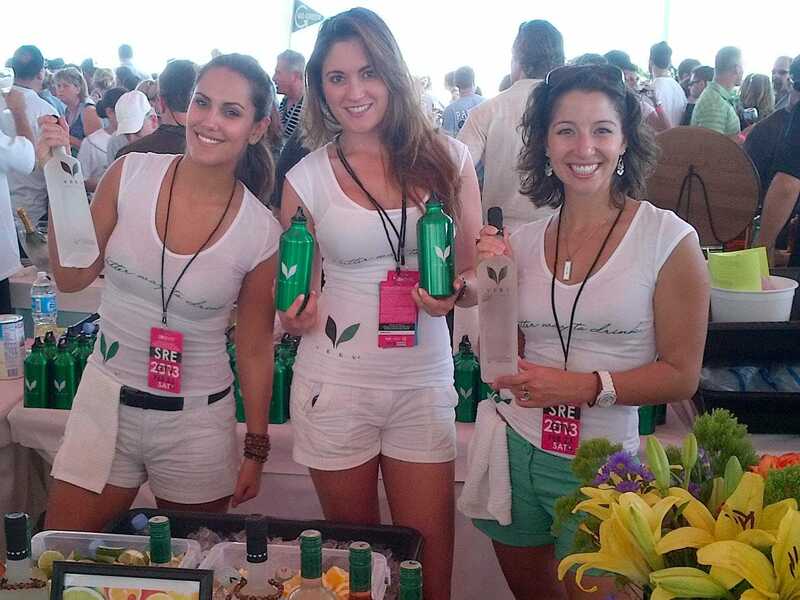 Aside from events and parties all across Miami Beach, the SBWFF Grand Tasting Village alone is the length of three entire city blocks, between 10th and 13th Streets. The supply and logistics compound that supports the entire Grand Tasting Village for three straight days is equally long. This is where personnel gather, supplies are staged, trash is processed and production teams have offices. Setup takes weeks, and planning each annual event takes up an entire year. This is a massive undertaking. 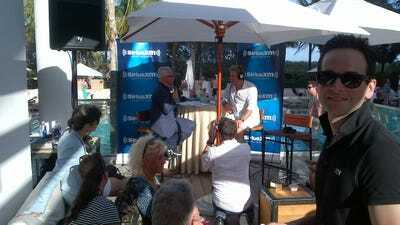 A few blocks away, I ducked into The James Royal Palm Hotel to see Geoffrey Zakarian host an XM Sirius radio show. The hotel is not only gorgeous, but Catch, the New York Meatpacking District hotspot restaurant, just opened in the hotel. 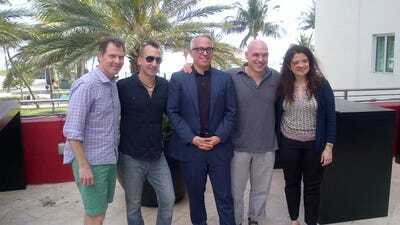 Iron Chef Geoffrey Zakarian hit the pool deck of The James Hotel to interview Anne Burrell, Curtis Stone, Lee Schrager, Andrew Zimmern, Al Roker, Marc Murphy and Scott Conant. In the foreground is Jaret Keller, Zakarian and Burrell's New York-based publicist. 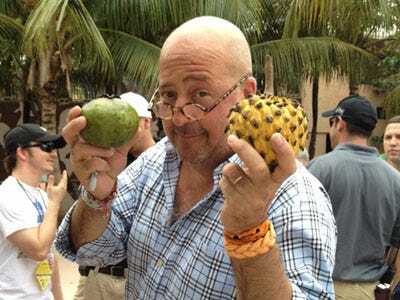 Now see how a famous chef does SOBEWFF.